Hey all! I am Channing, and I travelled with my boyfriend Shawn. Both early to mid 30s, from California. We have cruised Carnival twice and Princess once, so this was our first time on Royal. We originally booked a south pacific cruise out of Sydney but unfortunately, couldn&apos;t make it happen, so we opted for this cruise that looked really fun, and was easier on the budget. Shawn&apos;s mom lives near Orlando, so we were able to spend a few days with her pre-cruise. We spent most of our time lounging by the pool of her complex, and spent a day at a waterpark in Daytona! We also spent one afternoon picking up any last minute items we needed for the cruise (we are VERY light packers, especially when flying!). Sunday morning she was nice enough to drive us down to Port Canaveral and see us off. We arrived at the port about 1130, and we waited about 15 minutes for the security lines to open up for us "peasants", as Shawn would say. Once it opened up it went very quickly and the entire process was a piece of cake! We were on board, first drink in hand by 1230! Thoughts on the Ship: I loved it! I really appreciated the different neighborhoods and how they made the ship feel less crowded. We rarely waited for anything (but, we go out of our way to avoid the busy areas when they&apos;re the most popular). Shawn felt like it was too much like a city, but that&apos;s kind of what i liked about it. Stateroom: 4D Oceanview Balcony, room 9662. Midship Starboard. Great room! Very clean, bed was on the closet side. So quiet! We did hear the occasional chair shuffle from nearby balconies, but that was only if we were also outside. Shower is very small, but the glass doors are a nice touch, as opposed to those darn human-attacking curtains on Carnival! Our stateroom attendant was pleasant and worked very hard. We saw her every day. Dining: We thought the food was good throughout, with a couple of standout meals at Chops, Izumi and Giovannis. Buffet was just that...buffet food. Not overly hot or cold, but everything we ate had a good flavor and ok quality. We thought the dining room was good, but I felt it declined slightly as the week went on. Our first meal (really great) there was much better than our last, but not bad by any means. Service was always excellent. We opted for My Time Dining, and while we never waited for dinner, when we were getting seated it always seemed very clustered and overwhelming, People coming in, leaving, carts or trays of food and plates being carried in and out...just very hectic. But that was only close to the door, once we got inside and seated it was much more relaxing. Service was also pretty quick, dinner never took over an hour and a half, and even that was a longer dinner than most. I should note that we tend to be scarfers.. .many times the waiter would come back and be amazed we had finished so fast (which I didn&apos;t really think was THAT fast, but maybe it was?) We got a 3 night dining package as well. To make the most of specialty dining, Shawn and I usually share 3 or 4 appetizers and get and entrée each, and sometimes one to share. Giovannis was great. Awesome, quaint atmosphere. Food was spectacular, and portions were big. Izumi was really great as well. We only went for the sushi, as we have done teppanyaki a bunch at home (super fun if you&apos;ve never been, and more food than you can imagine). We got the sashimi platter and it was the biggest cuts of fish I have ever seen in a restaurant. The nigiri pieces and rolls were normal sized and everything tasted amazing. We ordered sake as well, and it had an interesting flavor that we just tolerated. The sake was also brownish, so Shawn thinks the added flavor may have been nutmeg or something similar. Overall a great meal. Chops was our absolute favorite! My filet was so tender and juicy. Shawn got the rack of lamb. The menu stated it came with a mint sauce, but he couldn&apos;t taste any mint, but still enjoyed it very much. He also said they had the best key lime pie he&apos;s ever had. whaaa???!!! Activities: Lots of fun stuff to do at almost all times of day. Get to trivia earlyyyy!! We ended up standing for quite a few, and we got there 10-15 minutes before the game. All the game shows and silly contests were a blast, very entertaining. 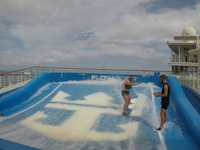 The flowrider is super cool, but harder than it looks! The casino is always one of our favorite spots, but we really need to remember that we only win on night one! The ice show was spectacular...i was not expecting a lot of the tricks and spins that the performers were able to do, amazing. CATS was also really great! Shawn is a theater major, and has seen Cats a few other times, but as a first timer, i really enjoyed it. The performers were flawless. I will say it&apos;s a little hard to follow at first, but stick it out, because it only gets better as the show goes on. Must see! Service: All the members of our waitstaff (in every venue) were so attentive and took a lot of care in our meal. Our room attendant was great, and really everyone we came accross during our week was friendly and smiling. We never waited more than a couple minutes for a drink at any bar, and we did see a lot of servers around the casino (and a few by the pool but not many for the area). Our ports were Labadee, Haiti, Falmouth, Jamaica, and Cozumel, Mexico. We have done cruise ship excursions before (only a couple), and we really prefer to do things on our own or book seperately from the ship. In Labadee, of course, this is impossible, so we just went off ship to check out the port, get a trinket (or 7... the marketplace was not fun. VERY pushy salesman that will not take no for an answer), and dip our toes in the caribbean for the first time this trip. We didnt even eat in port because it was a buffet and the line was...roughly 6000 people long. We will not seek out to stop here again, as we enjoy seeing some local culture in our ports, and this was just the cruise ship on land. Jamaica was awesome! We took a small shuttle van to Montego for $20 each round trip. It took us to a nice little resort area with a ton of beach, a pumpin&apos; bar vibe, and it was on this main drag of REAL jamaica, where we were able to get some authentc jerk chicken. YES! We have been dreaming of that lunch since we left, and we tried to duplicate it for dinner last night, but it wasnt even close. Jamaicans were incredibly friendly and helpful, and while Shawn got asked to try/take/buy pot about 7 times throughout the day, it wasnt a big deal because when we say no thanks, they just say "no problem, mon" and it&apos;s all good! Cozumel was so beautiful. Shawn had low expectations (we&apos;ve been to Mexico a few times before, so he wasnt super excited for ANOTHER stop there), but Cozumel was really great. We had arranged for a glass bottom boat snorkel tour through trip advisor for only $30 each (the same tour through Royal was $90 per person, but im sure that included lunch as well). We walked to a hotel just outside the port area and met a lady outside with the company&apos;s logo - SafeTours Cozumel. She greeted us (by name! ), and then told us we could go and enjoy the hotel amenities by the beach or pool until our excursion started. After about 20 minutes she gathers us and TWO other people to take us to the dock. That&apos;s right...4 people on this excursion...seriously! The crew on the boat were excellent. Fun, funny, helpful, knowledgeable, and it was obvious they cared about their job and what they do. They&apos;re called SafeTours because they take extra precautions to protect and rehabilitate the reefs in the area...so cool. The crew was able to dive much deeper than we could, and got lots of really up close pictures that they promised to send us via email. They also handed out beers, soda, waters as needed, and even made me a makeshift margarita. Highly reccomend these guys! After our snorkeling adventure, we set out to find a real Mexican lunch. We ventured downt the street a little further, and ran into Ernesto&apos;s Fajitas. We, sillily, asked our server what he would recommend here, and he quickly pointed to the entire page of fajitas. Ok then! A mexican lunch wouldnt be complete without a shot of tequila to seal the deal. Lunch was delicious and our table was in the open air restaurant that overlooked the bay. Overall, we really enjoyed this Royal ship, and while we did A LOT on board, we still didnt get to do it all. We will most likely book with Royal again, but possibly on a smaller ship. Super fun, jam packed with adventure! Trying the flowrider...not bad for a first timer! Hey all! I am Channing, and I travelled with my boyfriend Shawn. Both early to mid 30s, from California. We have cruised Carnival twice and Princess once, so this was our first time on Royal. We originally booked a south pacific cruise out of Sydney but unfortunately, couldn&apos;t make it happen, so we opted for this cruise that looked really fun, and was easier on the budget. Shawn&apos;s mom lives near Orlando, so we were able to spend a few days with her pre-cruise. We spent most of our time lounging by the pool of her complex, and spent a day at a waterpark in Daytona! We also spent one afternoon picking up any last minute items we needed for the cruise (we are VERY light packers, especially when flying!). Sunday morning she was nice enough to drive us down to Port Canaveral and see us off. We arrived at the port about 1130, and we waited about 15 minutes for the security lines to open up for us "peasants", as Shawn would say. Once it opened up it went very quickly and the entire process was a piece of cake! We were on board, first drink in hand by 1230! Thoughts on the Ship: I loved it! I really appreciated the different neighborhoods and how they made the ship feel less crowded. We rarely waited for anything (but, we go out of our way to avoid the busy areas when they&apos;re the most popular). Shawn felt like it was too much like a city, but that&apos;s kind of what i liked about it. Stateroom: 4D Oceanview Balcony, room 9662. Midship Starboard. Great room! Very clean, bed was on the closet side. So quiet! We did hear the occasional chair shuffle from nearby balconies, but that was only if we were also outside. Shower is very small, but the glass doors are a nice touch, as opposed to those darn human-attacking curtains on Carnival! Our stateroom attendant was pleasant and worked very hard. We saw her every day. Dining: We thought the food was good throughout, with a couple of standout meals at Chops, Izumi and Giovannis. Buffet was just that...buffet food. Not overly hot or cold, but everything we ate had a good flavor and ok quality. We thought the dining room was good, but I felt it declined slightly as the week went on. Our first meal (really great) there was much better than our last, but not bad by any means. Service was always excellent. We opted for My Time Dining, and while we never waited for dinner, when we were getting seated it always seemed very clustered and overwhelming, People coming in, leaving, carts or trays of food and plates being carried in and out...just very hectic. But that was only close to the door, once we got inside and seated it was much more relaxing. Service was also pretty quick, dinner never took over an hour and a half, and even that was a longer dinner than most. I should note that we tend to be scarfers.. .many times the waiter would come back and be amazed we had finished so fast (which I didn&apos;t really think was THAT fast, but maybe it was?) We got a 3 night dining package as well. To make the most of specialty dining, Shawn and I usually share 3 or 4 appetizers and get and entrée each, and sometimes one to share. Giovannis was great. Awesome, quaint atmosphere. Food was spectacular, and portions were big. Izumi was really great as well. We only went for the sushi, as we have done teppanyaki a bunch at home (super fun if you&apos;ve never been, and more food than you can imagine). We got the sashimi platter and it was the biggest cuts of fish I have ever seen in a restaurant. The nigiri pieces and rolls were normal sized and everything tasted amazing. We ordered sake as well, and it had an interesting flavor that we just tolerated. The sake was also brownish, so Shawn thinks the added flavor may have been nutmeg or something similar. Overall a great meal. Chops was our absolute favorite! My filet was so tender and juicy. Shawn got the rack of lamb. The menu stated it came with a mint sauce, but he couldn&apos;t taste any mint, but still enjoyed it very much. He also said they had the best key lime pie he&apos;s ever had. whaaa???!!! Activities: Lots of fun stuff to do at almost all times of day. Get to trivia earlyyyy!! We ended up standing for quite a few, and we got there 10-15 minutes before the game. All the game shows and silly contests were a blast, very entertaining. The flowrider is super cool, but harder than it looks! The casino is always one of our favorite spots, but we really need to remember that we only win on night one! The ice show was spectacular...i was not expecting a lot of the tricks and spins that the performers were able to do, amazing. CATS was also really great! Shawn is a theater major, and has seen Cats a few other times, but as a first timer, i really enjoyed it. The performers were flawless. I will say it&apos;s a little hard to follow at first, but stick it out, because it only gets better as the show goes on. Must see! Service: All the members of our waitstaff (in every venue) were so attentive and took a lot of care in our meal. Our room attendant was great, and really everyone we came accross during our week was friendly and smiling. We never waited more than a couple minutes for a drink at any bar, and we did see a lot of servers around the casino (and a few by the pool but not many for the area). 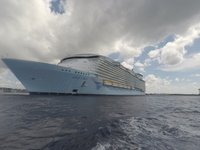 Our ports were Labadee, Haiti, Falmouth, Jamaica, and Cozumel, Mexico. We have done cruise ship excursions before (only a couple), and we really prefer to do things on our own or book seperately from the ship. In Labadee, of course, this is impossible, so we just went off ship to check out the port, get a trinket (or 7... the marketplace was not fun. 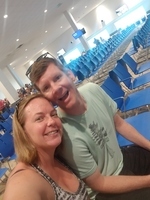 VERY pushy salesman that will not take no for an answer), and dip our toes in the caribbean for the first time this trip. We didnt even eat in port because it was a buffet and the line was...roughly 6000 people long. We will not seek out to stop here again, as we enjoy seeing some local culture in our ports, and this was just the cruise ship on land. Jamaica was awesome! We took a small shuttle van to Montego for $20 each round trip. It took us to a nice little resort area with a ton of beach, a pumpin&apos; bar vibe, and it was on this main drag of REAL jamaica, where we were able to get some authentc jerk chicken. YES! We have been dreaming of that lunch since we left, and we tried to duplicate it for dinner last night, but it wasnt even close. Jamaicans were incredibly friendly and helpful, and while Shawn got asked to try/take/buy pot about 7 times throughout the day, it wasnt a big deal because when we say no thanks, they just say "no problem, mon" and it&apos;s all good! Cozumel was so beautiful. Shawn had low expectations (we&apos;ve been to Mexico a few times before, so he wasnt super excited for ANOTHER stop there), but Cozumel was really great. We had arranged for a glass bottom boat snorkel tour through trip advisor for only $30 each (the same tour through Royal was $90 per person, but im sure that included lunch as well). We walked to a hotel just outside the port area and met a lady outside with the company&apos;s logo - SafeTours Cozumel. She greeted us (by name! ), and then told us we could go and enjoy the hotel amenities by the beach or pool until our excursion started. After about 20 minutes she gathers us and TWO other people to take us to the dock. That&apos;s right...4 people on this excursion...seriously! The crew on the boat were excellent. Fun, funny, helpful, knowledgeable, and it was obvious they cared about their job and what they do. They&apos;re called SafeTours because they take extra precautions to protect and rehabilitate the reefs in the area...so cool. The crew was able to dive much deeper than we could, and got lots of really up close pictures that they promised to send us via email. They also handed out beers, soda, waters as needed, and even made me a makeshift margarita. Highly reccomend these guys! After our snorkeling adventure, we set out to find a real Mexican lunch. We ventured downt the street a little further, and ran into Ernesto&apos;s Fajitas. We, sillily, asked our server what he would recommend here, and he quickly pointed to the entire page of fajitas. Ok then! A mexican lunch wouldnt be complete without a shot of tequila to seal the deal. Lunch was delicious and our table was in the open air restaurant that overlooked the bay. Overall, we really enjoyed this Royal ship, and while we did A LOT on board, we still didnt get to do it all. We will most likely book with Royal again, but possibly on a smaller ship. Super fun, jam packed with adventure! Spacious, quiet, clean. Bed was comfy!! balcony was good size, but the glass wasnt cleaned, so it was a little tough to get the view. Our crew, Miguel, Julian, and Captain Carlos were fantastic. Very knowledgable, funny, and prideful of their work. They hopped in and snorkeled with us, snapping pictures for us and enjoying the waters and reefs just as much as we were. They handed out beers, sodas and waters, and let us decide where our 3rd and final stop would be! So fun, great crew, amazing company! Jamaica is the coolest!!! We took a 30 minute shuttle to Montego Bay for $20 each round trip and found a nice little open spot of the beach. Water is so clear and warm you could stay in it all day! Found a little hole in the wall spot called Cafe Mocha and got the jerk chicken plate...OMG, delicious. Our mouths we on fire for a while too! Caught the shuttle back to port (a little hectic as there are A LOT of different shuttles and you have to take the one you came with back to port so there were a lot of people waiting for their shuttle), but the driver was nice and gave us lots of little tidbits of information regarding the area and Jamaican culture. Vendors in port were pleasant and not pushy at all, but were welcoming and kind. We found a small hand carved bust statue of Bob Marley in the very back corner of one of the stores...SCORE! The port was pretty! The drinks were good, but didnt eat in the buffet. The guys trying to sell you their products in the marketplace were extremely pushy and abrasive. Avoid going there unless you really need to shop. We didnt do any activities, but the zipline looked so fun! We spent a little time just watching people come in at full speed over the water.